It is not that often I can recall Easter falling on April 20th. So in an effort to cater to the tastes of both the Easter color lovers and 420’s Kush Lovers I decided to combine the two recipes. 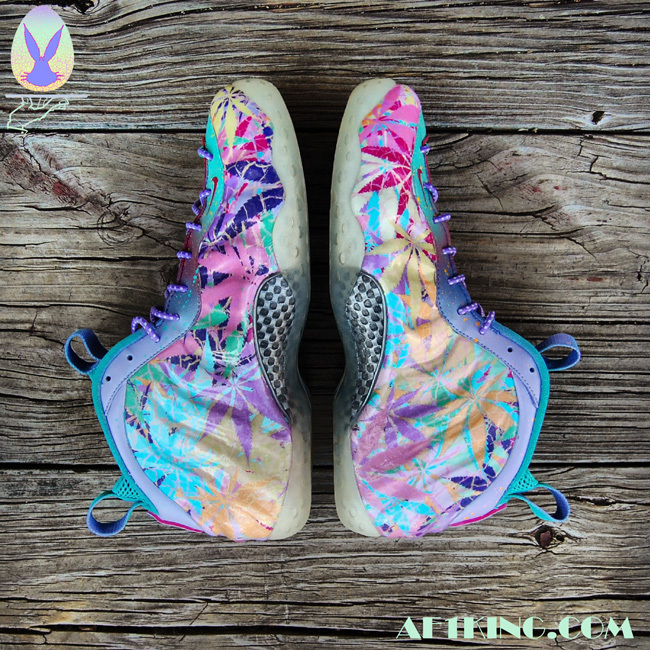 The canvas I chose was an all white foamposite one. I created a pastel cannibus print and re-textiled the upper adding a durable high gloss finish. The lacestay and lining are painted in a vibrant gradient fading from gift box blue to magenta, lavender, purple, and back to blue. Some great contrasts were added along with a clever lace swap. I added some custom insoles: one of which has a cracked eggshell print I created, and the other has the a fore mentioned cannibus print. A custom box and hang tag rounds off the piece which is now available for order in limited numbers. After the jump you can see more images and purchase a pair. Checkout options allow for an expedited airbrushed version or the re-textiled version (shown) which carries a much longer wait time.